Want to Live in the Mountains? Conifer May Be for You! Announcing Denver Real Estate Relocation...We are moving! First time home buyers, second time home buyers, investors whoever you are, our Denver real estate market in many sectors is prime for making a good deal. Many savvy buyers/investors realize this and are making their purchases now. Investing in Foreclosures is not for everyone. There are many aspects that need to be considered, researched and understood. If you are thinking about purchasing a distressed property, there's a new book that might help you understand the process. 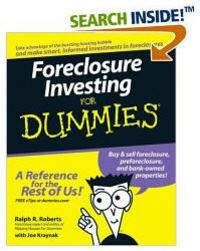 Written by Ralph Roberts it's called: Foreclosure Investing For Dummies. The book is written in plain English and talks about the different foreclosure purchase strategies. Working with foreclosures is not for the weak of heart. Armed with knowledge of the process, a solid strategy and some investment capital, a wise investor can make a good living by specializing in this market. The Dummy book is a valuable resource for those who wish to learn or merely brush up on their skills. I highly recommend it! It makes sense investing in real estate during depression since prices are falling but you should be very attentive to know when the prices hit the bottom, you might miss the ride.. You can park the properties and sell it later for a good price and remember “millionaires are made during economy depression!”. That's a nice book. Thanks. The dummies series is getting interesting they making dummy guides for sub niches. Do they make a book like that for people like me? Maybe a dummies for dummies or something? That book looks great, I can't wait to check it out! Thanks for sharing! "Official Spokesperson of Guthy-Renker Home"